Teach A Man To Fish was recognised by the UK's Foundation for Social Innovation (FSI) in their 2018 Small Charity BIG Impact Awards. 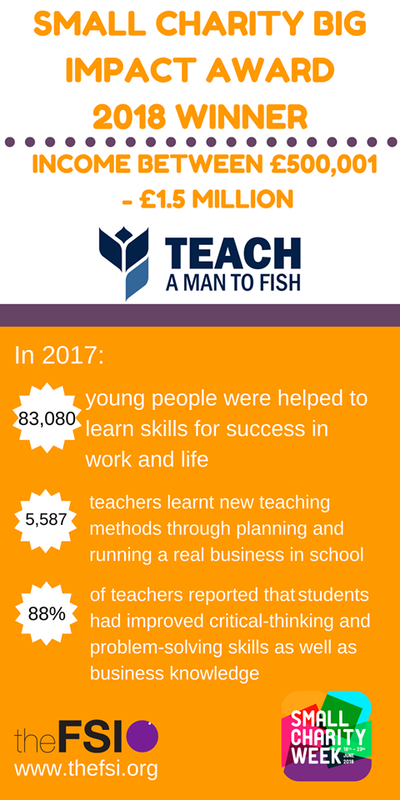 Announced during the Foundation's annual Small Charity Week, the FSI chose Teach A Man To Fish as it's winning charity with a turnover between £500,000 - £1.5 million. The Awards were initiated in 2017 to help raise awareness of smaller charities who are creating an impact at local, national and international levels. Over 350 charities submitted entries for the 2018 awards with only 5 organisations chosen as the top winners. The FSI said they selected this year's winners for, "campaigning and fighting for causes that will educate, relieve poverty, protect our planet, bring relief and ease the burden in times of disaster, and ensure the wellbeing of millions of men, women, young people and children across the globe. They are at the centre of making our world a better place in the UK and beyond." 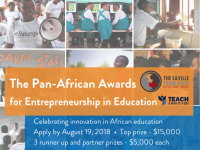 Teach A Man To Fish scored full points from the Awards' judges for demonstrating an ability to plan, collect data, assess and review across it's programmes - in particular, it's flagship programme the School Enterprise Challenge . 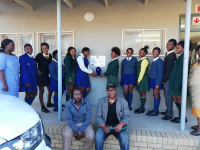 The FSI commended Teach A Man To Fish for its mission of enabling young people to develop the skills needed to lift themselves out of poverty through relevant quality education. The Awards recognised Teach A Man To Fish's achievement in reaching over 83,000 young people in 2017, along with 5,500 teachers - the majority of whom reported seeing an improvement in their students' critical-thinking and problem solving skills. Teach A Man To Fish is honoured to have been selected for the Small Charity Big Impact Awards. As a category winner, a short film has been created about Teach A Man To Fish's work and the FSI will provide exclusive impact and development sessions with Teach A Man To Fish throughout the year.